When it comes to automotive technology, we’ve seen a lot of advances in recent years – including more fuel-efficient vehicles, a rise in electric and hybrid engines, and the emergence of self-driving cars. That’s all great and wonderful, but it hasn’t addressed one of the biggest problem plaguing drivers everywhere: parallel parking. Fortunately, Canadian car buff William Liddiard has created the first (that we know of) truly omnidirectional wheels that can be bolted right on to a standard car. He mounted them on his Toyota Echo to showcase his invention. The so-called Liddiard Wheels are downright incredible. 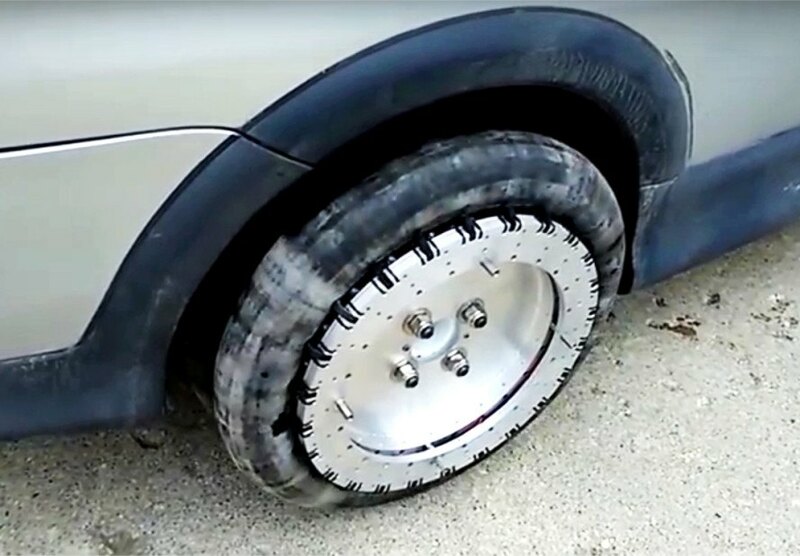 The inventor claims that, unlike other omnidirectional wheels in the world, his special wheels do not require a custom vehicle or axle setup in order to function like the 360-degree dream they are. Instead, the wheels can be bolted onto any regular automobile, in the same manner as factory wheels. That fact alone may be enough to kick Liddiard’s invention into the mainstream marketplace, but it gets even better when you see how well the wheels work. In order to design the wheels to turn quite literally on the spot, Liddiard determined that an enormous amount of torque would be required. So, he developed the setup to apply 24,000 pounds of torque directly to the wheels, which is a pretty amazing advancement on its own. With exquisite precision, a driver can move the vehicle in any direction, at any angle, which would pretty much eliminate the need for zillion-point parallel parking maneuvers. If you watch the video closely, which Liddiard swears was not modified with CGI, you can see exactly how the wheels work. The rubber surface of each tire actually rolls around itself, from the outside in or the inside out, depending on which direction the car is moving. This totally weird and totally amazing approach to omnidirectional wheels can reportedly be used on any type of rolling vehicle, which Liddiard hopes will help grab the attention of investors soon. Canadian car buff William Liddiard invented a set of omnidirectional wheels that can be bolted onto any vehicle, just like factory wheels. When it comes to automotive technology, we’ve seen a lot of advances in recent years - including more fuel-efficient vehicles, a rise in electric and hybrid engines, and the emergence of self-driving cars. That’s all great and wonderful, but it hasn’t addressed one of the biggest problem plaguing drivers everywhere: parallel parking. Fortunately, Canadian car buff William Liddiard has created the first (that we know of) truly omnidirectional wheels that can be bolted right on to a standard car. He mounted them on his Toyota Echo to showcase his invention.